I was browsing Instagram after a 14 hour day of work here at Luxury Branded when came across some creatives for the new iPhone app from Victor. I’m not going to lie, there are a lot of jet charter companies out there these days and it takes a lot to stand out from the rest. Victor is no stranger to creative marketing and the iPhone app they’ve released helps push them out there even more. The jet charter industry was and still is in dire need of a modern update and there are so few charter companies doing so. iPhone apps like these are literally a luxury concierge in your pocket and getting to where you need to be has never been easier. Victor recently also added this brilliant video on how to use their app and it really doesn’t get any easier than this. The ads for the iPhone campaign were done by Tiger Creative London and my hat goes off to them, it’s really a well done series of ads. It truly portrays the level of sophistication and glamour that should be felt when you think about flying private. It reminds me a lot of JetSmarter which is another brokerage that heavily plays off its app as well. Victor’s app is compatible with iPhone, iPad, and iPod touch which lets you easily see rates in real-time and book a flight within the touch of a button. For you Android users wondering why you’re left out again it’s mainly because affluent users tend to be on Apple devices by a long shot. From all the data we get to see from our clients analytics I can personally attest to that fact. Truly a magical time to be alive where technology not only can book you a private jet, but save money and best of all time. 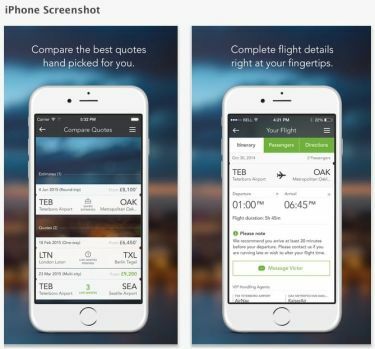 This app gets your direct access to over 7,000 charter jets worldwide so you’ll have no problem getting a flight a the flick of a finger. The real accomplishment is how they managed to land a jet on fifth ave.